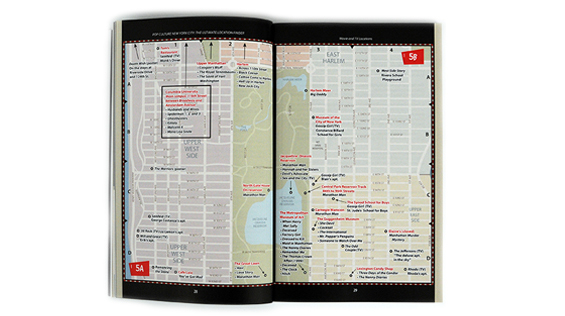 The ultimate pocket-sized location directory with illustrated maps for New York film and music fans. 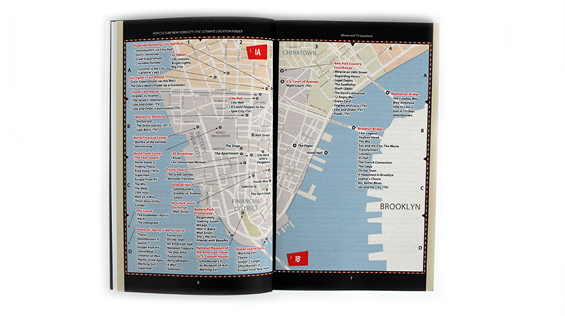 From the maker of PopSpotsNYC.com comes the ultimate New York location directory. 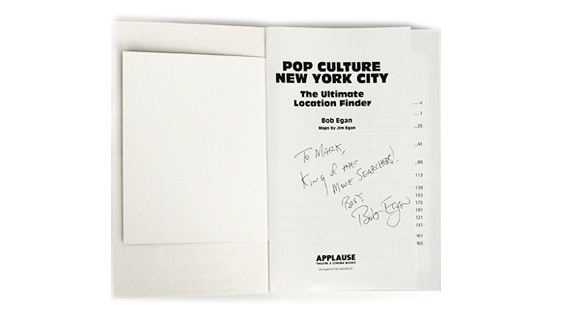 Bob Egan is a longtime New Yorker and pop culture enthusiast who has merged his interests to create the internationally known website PopSpotsNYC.com on which he tracks down the exact location of famous pop culture photographs shot in New York, including long-lost record album covers, famous rock photographs, and movie scene locations. His website has been profiled by websites, newspapers, and magazines all over the world and is followed by rock n roll and pop culture fans from over 100 countries. He is also a registered New York City tour guide and gives tours and lectures of his discoveries. 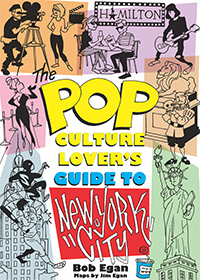 In paperback form, the guide provides locations references for over two hundred of the best known movies featuring New York City, titles such as Almost Famous, Big, Breakfast at Tiffany’s, Desperately Seeking Susan, Ghostbusters, Hannah and Her Sisters, Man on a Ledge, A Perfect Murder and many more. It also provides references for TV shows, Broadway Theatres, Concert Halls, Comedy Clubs, Music Landmarks, Jazz Clubs, Rock 'n Roll Hangouts as well as retro Album Covers from such artists as Bob Dylan, Blondie, Billy Joel and many more. There are several overview street maps of New York City all of which have been divided into equal sizes and of which clearly highlight points of interest with references to movies that have featured locations such as the New York County Courthouse, Manhattan Bridge as well as the Brooklyn Bridge, Federal Hall, Washington Square Park and Central Park, which has its own four page section and references the variety of areas within the park and combines a list of movies that have featured in each region. The five boroughs of New York; Manhattan, Brooklyn, Queens, The Bronx and Staten Island also have a dedicated map with film titles attached to each zone. 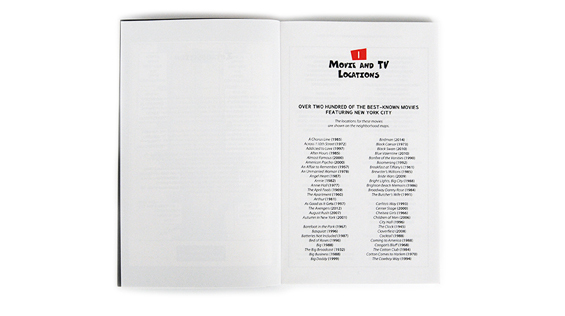 There are also references to Literary Landmarks as well as where New York City Superheroes hang out. With sub-sections to include Iconic Buildings, Bridges and Sculptures as well as New York City History, and Museums and Tourist Attractions. otsoNY Comments: What it lacks in photographs, it certainly makes up for in the vast amount of grid references made to the various movie locations in and around New York, and any disappointment that it doesn’t quite match the brilliantly presented PopSpotsNYC.com website quickly fades. 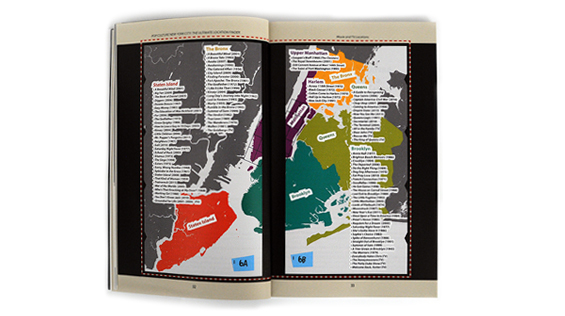 Formatted in an ideal size to carry on a journey around New York City, the paperback is easy to follow and doesn’t over-cook referencing, where other such publications have done in the past. The maps are easy to read and navigate around and have useful arrow-pointing markers to help identify locations where movies have been filmed. What is most unique about this book is the section that gives reference to annual NYC events such as the timed race up the 102 floors of the Empire State Building in February, the opening of the Central Park amusement rides in June, and during the festive season of December, SantaCon and the mass barhopping in Santa and elf outfits. So waste no time in purchasing a copy from Amazon and taking it with you on your next visit to the Big Apple. Special thanks to Bob Egan for sending us a copy, as well as mentioning the otsoNY website in the index section and for the amusingly-worded dedication. Also, don't forget to visit popspotsnyc.com for more detailed information, or simply click through the otsoNY's Record Cover Locations page.